So long Larry Summers! In this game of eeny meeny miny moe, it appears that Obama's index finger will ultimately land on Janet Yellen to replace Bernanke as chairman of the Federal Reserve. Summers was Wall Street's choice, but he withdrew from consideration, citing potential obstacles in the Senate confirmation process. While I greeted that update favorably, Yellen isn't high on my list either. "Obama leans toward Summers not on the merits but because the Wall Street bankers want him. Summers is one of the boys, and the bankers know that Summers will do their bidding, at the expense of everybody else." The authors added that Summers advocated for financial deregulation and shot down legislation capping bankers' bonuses—including bonuses for the AIG unit that helped trigger the banking mess. They went on to root for Yellen, citing her exemplary academic record and history with the Federal Reserve. "Yellen correctly foresaw the risks of the 2008 financial meltdown, while Summers famously missed it. 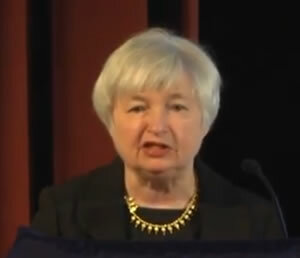 She, not Summers, has hands-on experience running the Fed." Summers is out of the mix now, but the "logic" behind this article made my blood boil. Just because one candidate is lousy does not mean the other is any better. "Yellen has advocated tough regulations since her time at the San Francisco Fed. She is credited for issuing early warnings that the housing bubble and unregulated financial practices threatened the economy. As the Fed's vice chairwoman she has called for additional financial system safeguards." Hmm… here's another way to look at Yellen's record: since joining the Federal Reserve's Board of Governors in October 2010 and becoming a permanent voting member of the Federal Open Market Committee (FOMC), she has never cast a dissenting vote against the monetary action recommended by Chairman Bernanke. If the near collapse of the banking system was caused by deregulation and AIG's toxic loans—which she spoke out against—how competent a leader is Ms. Yellen? Did anyone heed her early warnings? No; and her inability to push her peers toward preventative measures is an indictment of an ineffective executive. In the business world, saying "I told you so" could get you fired. However, like so many things government, activity is mistaken for accomplishment. An effective executive makes sure he or she is heard and gets the job done. What about Yellen's leadership since the crisis? "Yes, the total earnings tally reached a new quarterly record in Q2 and the rest of the aggregate metrics like growth rates and beat ratios look respectable enough. But all of that was solely due to one sector only: Finance. … Finance results have been very strong, with total earnings for the companies that have reported results up an impressive +30% on +8.5% higher revenues. … Excluding Finance, total earnings for the remainder of S&P 500 companies that have reported would be down -2.9% from the year-earlier period. It looks like too big to fail banks are certainly succeeding. So, Yellen's hands-on experience running the Fed has accomplished full employment in the financial sector. Perhaps that's supposed to trickle down to the rest of us. Providing financial services to depository institutions, the US government, and foreign official institutions, including playing a major role in operating the nation's payments system. If any public company failed at its mission so miserably, the stockholders would throw out the entire management team. It is time for accountability. While the Federal Reserve holds down interest rates and floods the banking system with money, it's destroying the retirement dreams of several generations. The Employee Benefit Research Organization reports that 25-27% of baby boomers and Generation Xers who would have had adequate retirement income—under return assumptions based on historical averages—will run out of money if today's low interest rates are permanent. In short, we can't sit around and hope for trickle-down crumbs from the financial sector. It all reminds me of AT&T's "reach out and touch someone" campaign from the '80s. Well, AT&T got too big for its britches and wanted to soften its image. The Justice Department broke it up shortly thereafter. Seems the monopoly was touching our wallets a bit too much. How much more proof do we need? We are fed up with the Federal Reserve bailing out banks at the expense of everybody else. Seniors and savers have been sacrificed for the benefit of the banking system, and the Federal Reserve orchestrated it all. We can't afford any more of Janet Yellen's so-called leadership. How about nominating someone who can keep her hands to herself and out of our wallets? Whether Janet Yellen becomes the next Bernanke or not, it's important to understand the impact that political decisions have on the financial futures of all investors. I'm definitely keeping track and will have a lot to say, I’m sure, as we get nearer to moving her in. Get all of my commentary on this and other items of interest to you by subscribing to our free weekly publication, Miller's Money Weekly. You'll be glad you did.